streamlined decrease, standard decrease, wale deflection decrease, double decrease, bias decrease. When I get a moment, I’m going to collate all of the information in this post into a printable PDF, but until then please have patience and of course feel free to point out glaring technical errors. Apologies for the lurid greenness my samples, it was what was on hand. [I think the Hulk would be proud of me, though]. 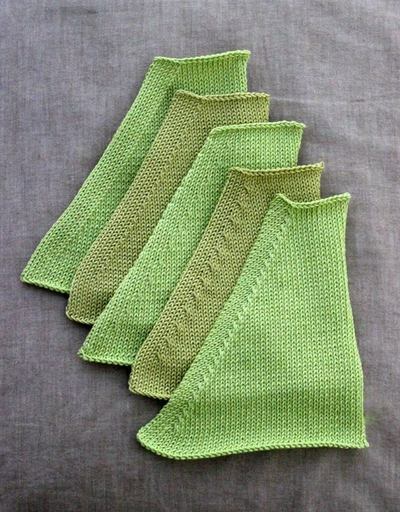 All of the samples in the photo above were knit on a standard [4.5mm needle spacing] gauge knitting machine for speed, but could be just as easily knit by hand. The yarn was cheapo 4 ply cotton. The other thing I should mention is that I used a 6-point transfer tool for all of the samples. Experiment with the number of points/stitches for different effects. All of the samples were knit to emulate the standard ‘decrease 1 st every alternate row’ raglan formula. This is reflected in the written instructions. The first two decreases are very well known and serve more as something to compare the later decreases to than anything else. I call this a streamlined decrease simply because of the sharp, clean line created by stitches cutting across stitches. Hand knitters will be very, very familiar with this type of decrease, it being used in 90% of commercially available patterns. An extra step, although not a very difficult one, is required for machine knitters to achieve the same effect. *Counting from edge of work towards centre of bed, using a single-point transfer tool place the 7th st onto the 6th needle. Transfer all stitches towards centre to fill space left by empty needle. Return newly empty needle at edge to non-working position. *Knit 5, ssk, work to end. *Work to last 7 sts, K2tog, k5. This decrease is very similar to the previous example, but slightly less graphic. *Using a 6-point transfer tool, move edge 6 sts in by 1 needle. Return empty needle to non-working position. *Knit 5, K2tog, work across row. *Work to last 7 sts, ssk, k5. As you can see in the sample, the edge stitches are deflected by the decrease [hence the name] and bounce off at an angle. This type of fashioning looks good in finer yarns and shows up best worked several stitches away from the edge [my default number is six regardless of gauge]. My Italian colleagues call this decrease “one at the edge and one on the inside”, which is an odd way of explaining that two different decreases are used on alternate shaping rows – once at the edge and then once several stitches inside the edge. Knit 2 rows [or as many rows as your pattern dictates]. Using a single point transfer tool, move edge st onto adjacent needle. Work to last 2 sts, K2tog. This is the same classic fully-fashioned decrease often seen on commercially produced knits. In industrial production, sweater manufacturers use this particular method for a very simple reason - to save time [time is money!]. By decreasing two [or more] stitches at a time, they can knit twice [or more] the amount of plain rows before having to stop again. As a by-product, they also get a more pronounced effect to their shaping. Compare the double decrease with the standard decrease and you’ll see what I mean. When working with heavier yarns, you might want to reduce the number of plain stitches worked before and after the decrease for a more graceful look. To work this decrease by hand, a cable needle is necessary, it functions as a temporary third needle allowing you knit pairs of non-adjacent stitches together. *Using a 6-point transfer tool, move edge 6 sts towards centre by 2 needles. Return both empty needles to non-working position. **Knit to last 8 sts, slip 2 sts onto cable needle and hold cable needle parallel to and in front of the left needle. *Insert right needle into first st on cable needle and at same time into first st on left needle, knit these 2 sts tog; rep from* once more - 2 sts decreased. Knit remaining 4 sts on left needle. The bias decrease is a simple variation on the double decrease. Adding an increase at the beginning and end of the row causes the decreases to move across the fabric, pulling the edge stitches into a bias slant. Added to this, increasing into the first/last stitch has a cancelling out effect on the double decrease, reducing it to a single decrease. It obviously follows that to maintain the standard raglan formula, the decrease has to be repeated every two rows and not every four rows as in the previous example. This decrease looks especially good on raglans, creating a chevron effect where the bias stitches meet at the seamline. It’s commonly found on classic fine-gauge knitwear along shoulder seams and sleeve caps. The handknit instructions are particularly wordy, but please don’t be put off. All you are doing is increasing one stitch to bring the double decrease back to a single decrease. Try it, it sounds much harder than it is. Incidentally the term of reference my Italian colleagues use for this is “increase one, decrease two”. I think it sums up this little manoeuvre extremely well. There are now two empty needles in working position at the edge. **Inc 1 into first st, knit 3, slip 2 sts onto cable needle and hold parallel to and behind left needle. Ps. A big shout-out to Domiknitrix, who I just noticed has listed me on her inspirations page! Just stumbled on this thanks to Google. Wonderful explanation, one which is going into my bookmarks right away! dies Beispiele sind spitze!!!! Weiter so !!!! Ha!Ha! Thanks! But the PDF idea was just so that I can make it look a bit better, and is more convenient for people to make a hard copy. Let me know if you find any technical glitches. Wow! I'm not waitin' for the PDF! It's printable NOW!